Esports, and other games : Valhalla rides high! Members of Team Vengence (Valhalla) being the first all female team to win the SA National Championships esports League of Legends title. For the first time ever in Mind Sports South Africa's history, a team consisting only of females has won the SA National Championships (mixed division). Few will truly understand the importance of Team Vengence (Valhalla) winning this event. 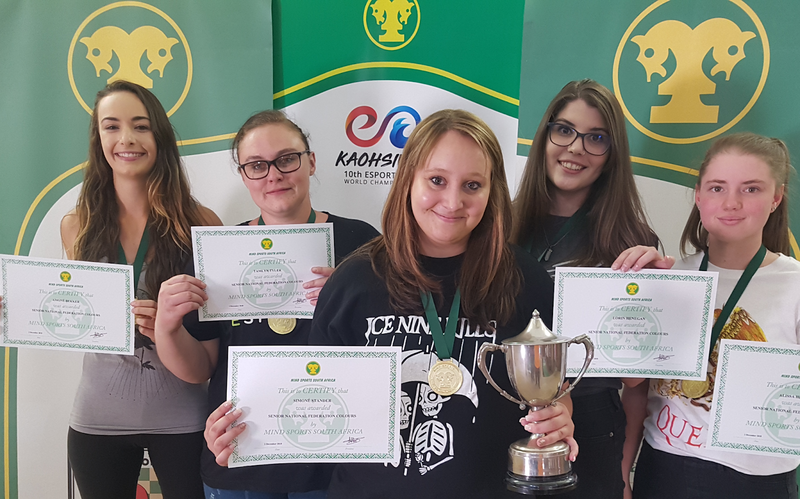 Not only do the members of Team Vengence walk away with the cutlery and the title of South African National Champions, have fulfilled one third of their obligations to qualify for selection for the 2019 National Squad, been awarded National Federation Colours, and have also becomes the first all female team to be awarded the title of South African League of Legends Ladder Champions. The Ladder works on a system of challenges throughout the year in order to give clubs the opportunity to improve their teams/players' playing skills outside of the normal MSSA championships. The Ladder allows teams/players' to experiment with new tactics, combinations, etc. Teams through Member Clubs may challenge any club on the ladder. Any club so challenged has 5 days within which to respond and play the match. Such rule allows the ladder to retain its dynamic nature and stops the challenged club from delaying unnecessarily. However, any team challenged during any official MSSA event while both teams are participating in such event, and are paired by the umpire to play against each other, must play such challenge. This means that any or all games in a MSSA Regional, Provincial, and/or National Championship may count as ladder games. The full rules for the ladder may be found here: Important changes to MSSA's Inter-Club Ladder rules.